You’ve been there and done that. You’ve misplaced your wallet, your keys, and more importantly, your sunglasses. Yesterday, it was your chapstick and the checkbook. And how you lost your phone, you don’t know, as it’s practically attached to your body. But, yes, it happened. Socks and umbrellas? You only wish they were cheaper. What about fear? 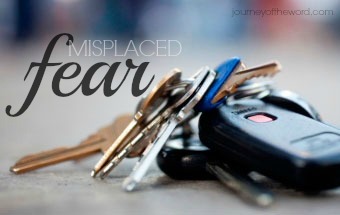 Have you misplaced your fear? Fear plagues humanity. Fear of bullies, spiders, thunderstorms, and darkness. Fear of tomorrow. Of evil, and pain, and suffering, and death. Fear of failure. Fear of the unknown. May I argue that we shouldn’t get rid of fear? Fear must simply be kept in its rightful place. A few observations on whom, what, where, when, and why we need to fear. Do not fear suffering, but be faithful. Do not fear for your safety, for God is with you. Do not fear what men can do. Fear what God can do. Do not fear sickness or death. Only believe in the Healer and Lifegiver. Then came one of the rulers of the synagogue, Jairus by name, and seeing him, he fell at his feet and implored him earnestly, saying, “My little daughter is at the point of death. Come and lay your hands on her, so that she may be made well and live.” And he went with him. And a great crowd followed him and thronged about him. Do not fear while doing good. Fear God’s judgment of evil. Does fear have its proper place in your life? The above points provide just a few examples taken from a study of the New Testament’s usage of the word “fear” [phobeo/phobos]. Thank you for your thoughts, Lydia! I especially like the Scripture-heavy content. You have let Him say it! Thanks, Rebecca! That is my goal at journeyoftheword.com . . . to point to what He says.